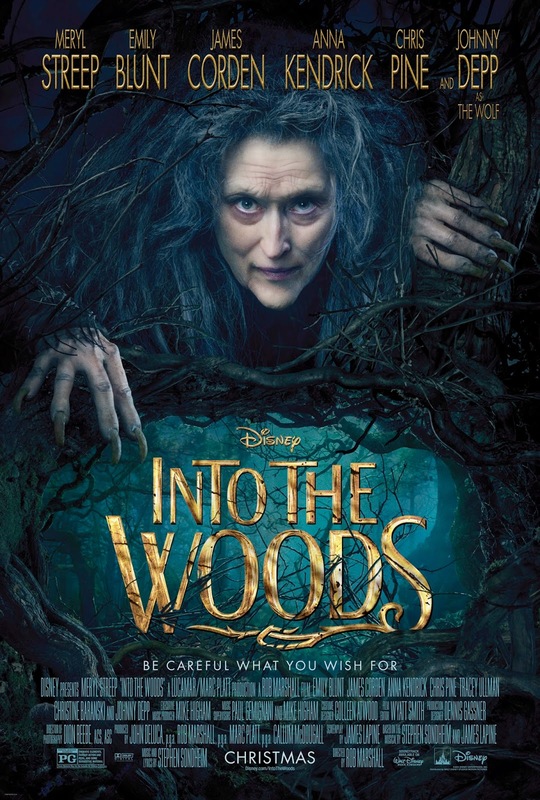 Director Rob Marshall (Chicago) returns to the musical with a film adaptation of Into the Woods, Stephen Sondheim's 1986 concoction that intertwines the plots of several Brothers Grimm fairy tales. Given this was produced by Disney though, many will surely think of it as another way for the mouse house to repackage their most classic of animated tales and turn them into a new holiday hit. Those same people will likely be somewhat surprised when some of the more violent twists of the Grimm tales come to light in the film. All of that said, Marshall's version of Into the Woods feels like a missed opportunity more than anything. I haven't seen the Sondheim play that serves as the source material, but I imagine there is much more to it than what has been put to the screen here. This film version never delves too deep into the familiar tales the main characters are taken from (which is fine) but it also doesn't have enough material in its original aspects to fill out the running time of a feature and so the last almost hour ends up feeling completely tacked on. This is a shame, really, because as far as musicals are concerned I was really digging what they were doing story-wise and Marshall has a keen eye for how to shoot people singing dialogue while making it exhilirating. What I don't understand is why they weren't able to somehow extend the story into one cohesive narrative rather than seeming to wrap up all the storylines nicely only to unravel them over the next fifty minutes so we end up with a less than satisfying conclusion that, more than anything, undermines all they'd worked so hard to set-up in the first place. And while this certainly takes a fair amount of enjoyment out of an experience you expect to be filled with familiar character tropes and choreographed numbers there is still plenty to feast your eyes and ears upon. Into the Woods may not be everyone's cup of tea and it may not even prove to be appealing to those who compare it to the stage show, but what it offers and what detracts just about even each other out to the point we care about what's happening while we're watching it, but won't remember a thing the next day. 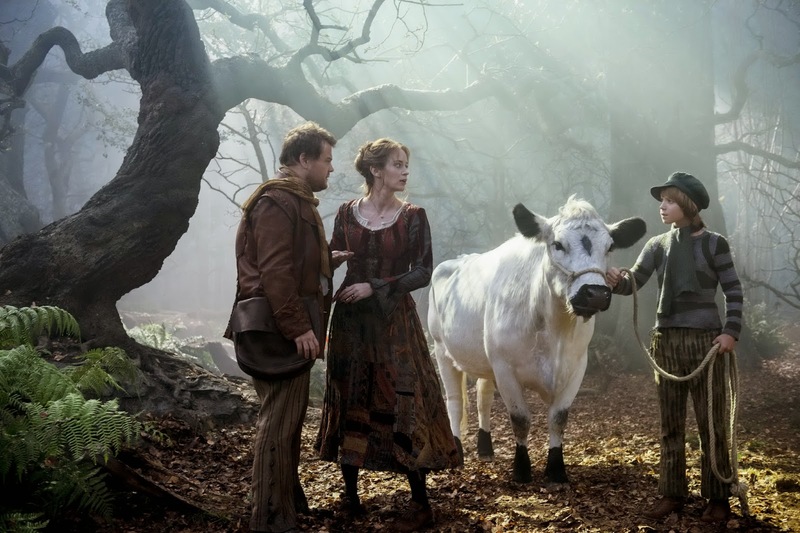 The Baker (James Corden) and his wife (Emily Blunt) bargain with Jack (Daniel Huttlestone). Into the Woods twists the Brothers Grimm fairy tales into a musical format incorporating the likes of classic tales such as Cinderella (Anna Kendrick), Little Red Riding Hood (Lilla Crawford), Jack (Daniel Huttlestone) and his Beanstalk as well as Rapunzel (Mackenzie Mauzy). Each of these familiar stories are tied together by the original element that involves a baker (James Corden) and his wife (Emily Blunt) who wish to begin a family, but have been cursed with a spell by The Witch (Meryl Streep) that lives next door. This curse prevents the baker from reproducing, but if he is willing to go out and obtain four specific items it would allow The Witch to conjure up a potion to reverse her spell. What The Witch gets out of the bargain and why she comes to the door of the baker and his wife in the first place is something of a mystery, but people are singing while conveying full-fledged conversations so we forgive a certain amount of logic. The Witch instructs the baker that she needs a cow as white as milk, a cape as red as blood, hair as yellow as corn and a slipper as pure as gold in three nights time and so the stage is set. These items of course pertain to the familiar characters while adding a new perspective on their original narratives. Red Riding Hood still runs into the wolf (Johnny Depp) and leads him to her grandmothers house, Jack still trades the cow (you know, the one that's white as milk) for beans that in turn grant him access to a land of giants and Cinderella still goes to a ball despite the warning of her wicked stepmother (Christine Baranski) and step-sisters (Lucy Punch and Tammy Blanchard) to meet a charming prince (Chris Pine), though Rapunzel does seem to get the short end of the stick here. And yet, while the goal of the plot would seem to be for the baker and his wife to obtain their items and reverse the spell this conflict is resolved in a surprisingly efficient manner and so when everything comes to pass that makes all that was wrong seem right the forty-five minutes left to go left me feeling as if I'd watched two different movies. The catalyst that sets this second part of the film into motion is an unexpected "earthquake" that leads all of our main characters back "into the woods." Naturally, this is a repercussion of the actions the baker and his wife took to reverse their spell from The Witch, but these repercussions are never incorporated into the story as well as the fairy tale elements are in the first half. There are plenty of unexplained facets of the script that I might have missed, but don't feel like there is sufficient enough time devoted to them. It is a strange predicament for a film as most at least feel cohesive throughout and while the tone and musical stylings are consistent, the events and turns that begin to take place once everything is thrown out of whack also seem to come out of left field to the audience. The first of which are the reasoning behind many of the transformations within the witch, followed by relationship reversals dealing with the Prince and Cinderella. Kendrick's lowly maid turned princess always showed a sense of hesitation to commit to Prince Charming, but not until this fracture occurs do we see any real evidence of that suggestion take place. There are of course other seeming inconsistencies, but without spoiling too much it seems it is the overall objective of the musical to take our expectations and twist them into something deeper, something more interesting by relaying real world themes through a fantastical world, but the problem is (in the film version at least) it doesn't know how to accomplish incorporating and conveying these undercurrents. Much could be discussed concerning the arc of Emily Blunts role as she encapsulates much of what other characters are singularly present for. Though she plays what is essentially a minor role in the grand scheme of things it is her that ends up connecting the most with the struggle of what is being presented. She is a wife, craving to be a mother, she is selfless while willing to do whatever it takes to fulfill her wishes and she is brave while fearing where her status as a peasant places her in the world. Blunt is such a diverse actress, able to take on any state of mind and believably bring that to a character with little effort and while Into the Woods looks to discuss how life isn't a fairy tale through the meanings and consequences of large topics such as responsibility, children, legacy and all that comes along with our pre-destined roles it is the path of her simpleton that best displays the films thoughts on life and our experiences in it. Cinderella (Anna Kendrick) debates whether or not she wants Prince Charming to rescue her. As for the rest of the ensemble cast, each do more than I might have ever expected from a group of non-Broadway actors signing up to sing. Streep, per usual, is fantastic as The Witch. When she breezes into the bakers shop in her first scene and spits out rhyme after rhyme, upping the intensity all while discussing her garden and her greens it is clear she is not only having a fair amount of fun, but is spewing her sing-song dialogue with such delight that she is camping it up to a certain extent so as to be on par with the comedy of the piece. The comedy of it all plays greatly into the ridiculuosness of the fact this is a musical while the actors play amp up the trope aspects of their roles because the point of using familiar characters is the fact they are indeed tropes. Excelling at this especially is Chris Pine who, along with Billy Magnussen, exploit their cheesy Prince Charming facades in a hilarious number about agony while never failing to reveal themselves as the spoiled, shallow brats they truly are. Kendrick, furthering something of a musical niche for herself, is perfectly cast as a kind of alternative Cinderella where she is asked to approach the male on a pedestal with a more leveraged look and in doing so translates the little significance of looks and wealth in a loving relationship. Along with Blunt, Corden is especially sincere (and naturally funny) in his emitting of dealing with his past to make better his future. Mauzy is the one we hardly get to know as her underdeveloped Rapunzel suffers from the story not integrating her into the narrative given her character matters little other than to develop The Witch further. As with many a musicals it is the production value combined with the talent that really allow them to either leave an impression or not. In both of these regards, Into the Woods excels. From the opening shot and note the film possesses an energy that is contagious. The interaction among the characters is smooth, the directives of each individual set-up and the songs intelligently thought out and worded to the point we are caught up in paying attention to what is being sung so that we don't miss a thing. Marshall and his production designer, Dennis Gassner, have crafted a gorgeous film with richly detailed sets and lighting that melds the grimness of reality in a dark wood and the stage production that takes us out of that reality just enough to know this is all still within the realm of make-believe. It feels more difficult to assign this film a rating than usual given I enjoyed so many aspects of it and really wanted to love it after we were allowed to really dig into the quest, but in trying to do something with more substance, in trying to really say something it falters in its execution. This is certainly a trait to be admired and appreciated even though what we end up with is something of a muddled message.